USB 3.0/3.1 is fast enough to accommodate almost any external device at full speed. This includes network adapters. Need an extra RJ-45 network port on your system? Do you have a portable netbook or laptop that you need to plug into a LAN quickly? 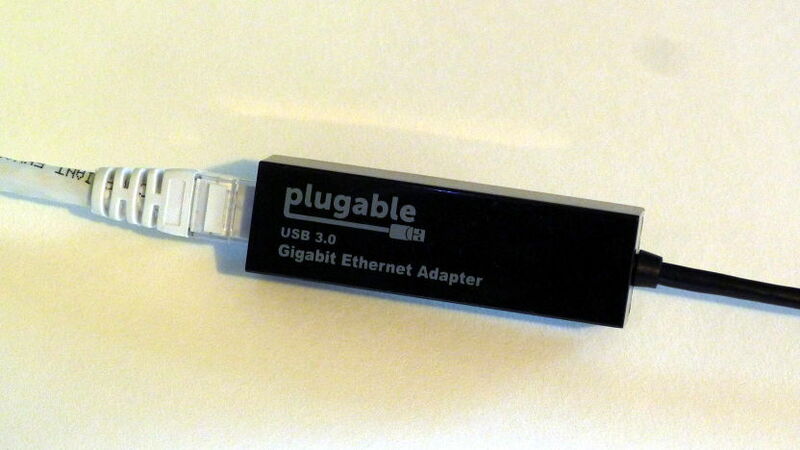 The Plugable USB 3 ethernet adapter is a small device that allows you to connect a computer to a LAN through a USB port. It offers full duplex throughput up to gigabit speeds if connected to a USB 3.0/3.1 port. And best of all, it is 100% plug-and-play compatible with Linux. 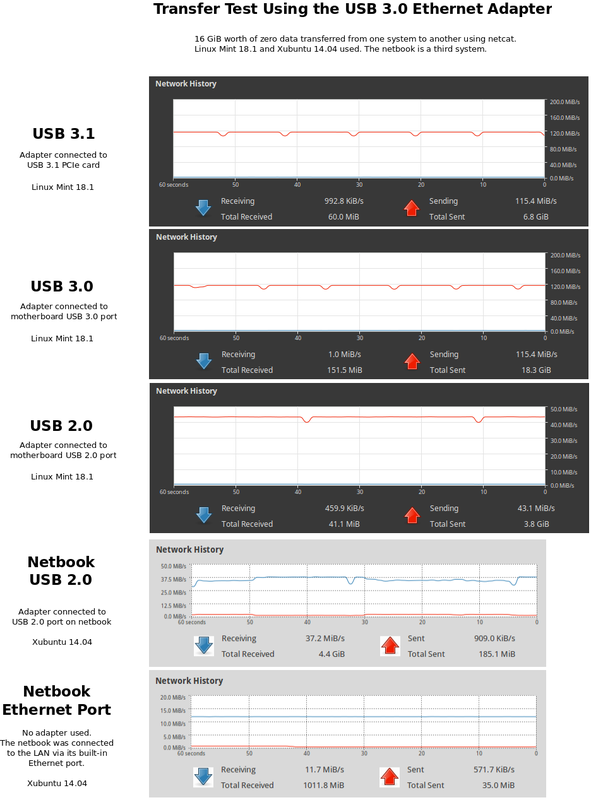 Here are my results after using this device with Linux Mint 18.1 and USB 2/3/3.1. This USB device serves the same purpose as the Ableconn USB 3 ethernet adapter. If you have used one of these before, then you know what to expect. Plug it into any free USB port, and then plug a standard network cable into the adapter (assuming the other end of the cable connects to your LAN). Box Front. 10/100/1000Mbps networks are supported. However, the USB speed will limit the throughput. Box Back. Even though there is no mention of Linux on the packaging, this adapter is 100% compatible with Linux Mint 18.1 and Xubuntu 14.04 from my tests. Box Contents. Includes the adapter, a mini-CD containing Windows drivers, and a short page of instructions. This device is so easy to use that I found the instructions to be unnecessary. This version has a Type-A USB connector. A version with a Type-C connector is also available, but I did not have one of those to try. I tried Xubuntu 14.04 and Linux Mint 18.1, and this adapter works perfectly with both. Simply plug it in, and Linux automatically recognizes it. No manual driver installation was needed. The USB adpater may appear as “ASIX Elec. AX88179” in the panel notification area if you click the network icon in the panel. Here, the USB adapter is connected to a LAN. Linux treats the USB adapter as a regular NIC (Network Interface Card), so you can assign a static IP address or use DHCP. You can configure this adapter like any other NIC. Even though the box touts “USB 3.0,” you can plug this into any USB port, and it will work. However, you will be limited to whatever speed of the USB port you use. Plugable adapter connected to Cat6 cable. For example, USB 3.0 and USB 3.1 (using a PCIe USB 3.1 card) both allow the adapter to operate at the full gigabit Ethernet speed. I saw not difference in performance from a motherboard Ethernet port or a dedicated Ethernet NIC. File transfers were as fast as gigabit Ethernet would allow. However, a USB 2.0 port was much, much slower when connected to the same gigabit LAN. Not because the adapter was faulty, but because USB 2.0 is limited to 480 Mbps max. So, does this operate at full gigabit speeds? Yes…IF plugged into either a USB 3.0 or USB 3.1 port. USB 2.0 is slower. I performed synthetic 16GB data transfers with netcat between two computers connected to the same gigabit LAN. 192.168.10.10 is the static IPv4 address assigned to the USB 3 adapter. I also unplugged all other network cables and manually specified a route using the USB adapter. I monitored the transfer with bmon, iftop, and the network activity in System Monitor. What is the throughput when transferring 16GiB worth of zero data using netcat? 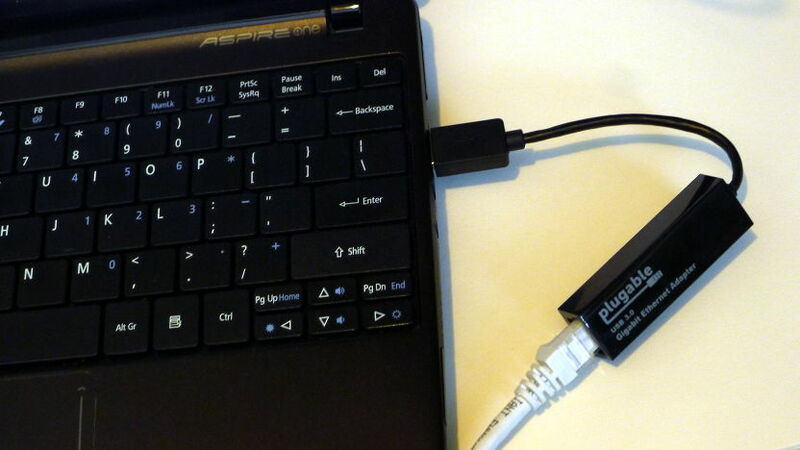 For comparison, I also tested the Plugable adapter with the Acer Aspire One 722 netbook running Xubuntu 14.04. 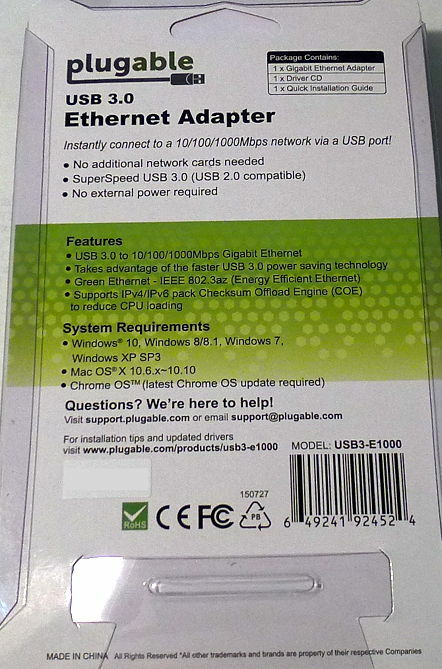 The netbook is limited to a USB 2.0 port, and its built-in Ethernet port is limited to 10/100Mbps, not gigabit. 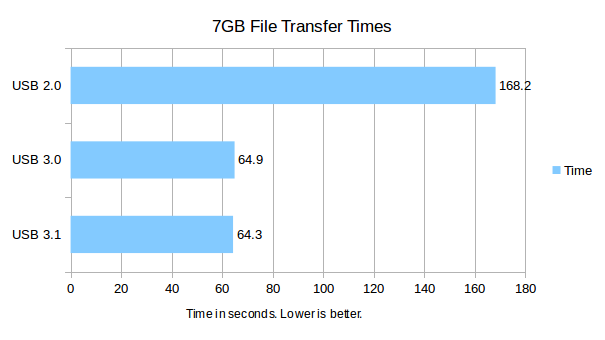 Comparison of the highest sustained transfer speeds observed. The results were the same sending and receiving between two computers. No other network traffic. USB 2.0/3.0/3.1 used the same system. USB 3.0 and USB 3.1 tie at 115.4 MiB/s since this is the limit of gigabit Ethernet under ideal conditions. The netbook was interesting. The Acer Aspire 722 has a built-in 10/100Mbps Ethernet port, and this is a case of where an external USB network adapter would be useful. Plugable adapter connected to the USB 2.0 on the Acer Aspire 722 One netbook. This provides a much faster network connection than the netbook’s builtin 10/100 Ethernet port. When connecting the netbook to a LAN using an Ethernet port, speeds top out at a constant 11.7 MiB/s. But when the USB 3.0 adapter is plugged into the netbook’s USB 2.0 port, then the transfer rate is increased to over triple the speed at 37.3 MiB/s. However, the netbook’s USB 2.0 rate is still a little lower than a full system’s USB 2.0 rate. How about transferring a real file? I formed a 7GB ZIP file of random data, and used time in Bash to measure how long it would take to transfer over the network using the FTP protocol. I installed ftp-upload for this. ftp-upload is a program designed to script file transfers. data.zip is the 7GB data file, and 192.168.10.10 is the destination computer to transfer the file to. This test was performed with each USB port to check for differences. An SSD to SSD file transfer was performed to eliminate any hard drive bottlenecks. 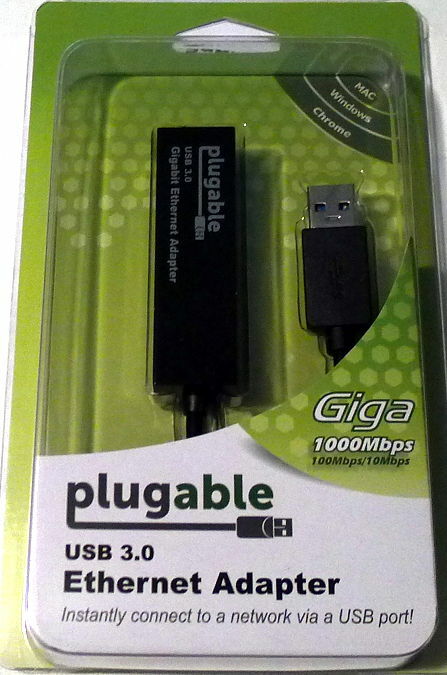 How many seconds to transfer a 7GB file over the gigabit LAN using the Plugable USB 3.0 adapter? FTP transfer results. USB 3.0 and USB 3.1 pretty much tie again due to the limitations of gigabit Ethernet. Both took a little over one minute to transfer 7GB while the USB 2.0 port took almost three minutes at 2m48.2s. We have another product that lives up to its box claims! With a USB 3.0/3.1 port, the Plugable USB Ethernet Adapter will transfer files as fast as a plugin NIC, and it plays seamlessly with Linux. 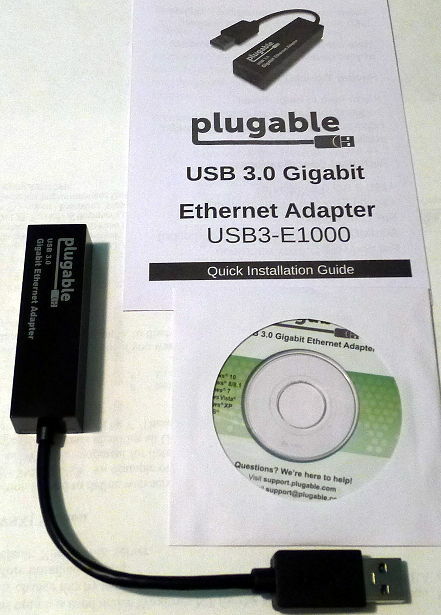 A device like this is especially useful with a netbook or for any situation requiring a quick but speedy network connection without opening up a computer. This entry was posted on January 25, 2017, 6:00 PM and is filed under linux. You can follow any responses to this entry through RSS 2.0. You can leave a response, or trackback from your own site.